I attended Global Pet Expo last week. 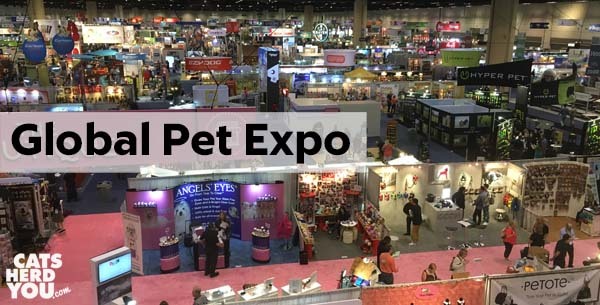 This pet products trade show is huge, over 3,000 booths covering the space of about 6 football fields. 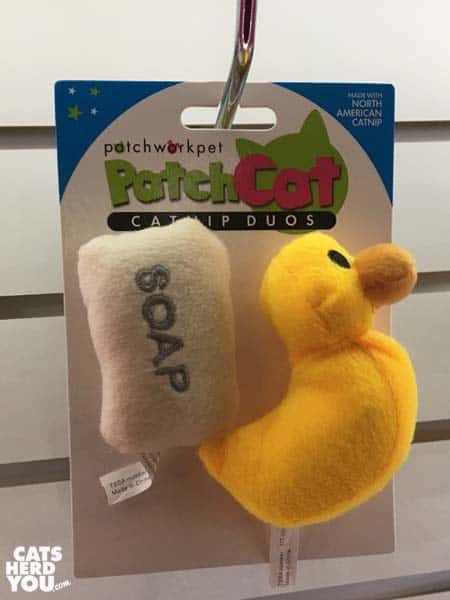 There were new products for everything from cats and dogs to fish and hamsters. Even chickens! 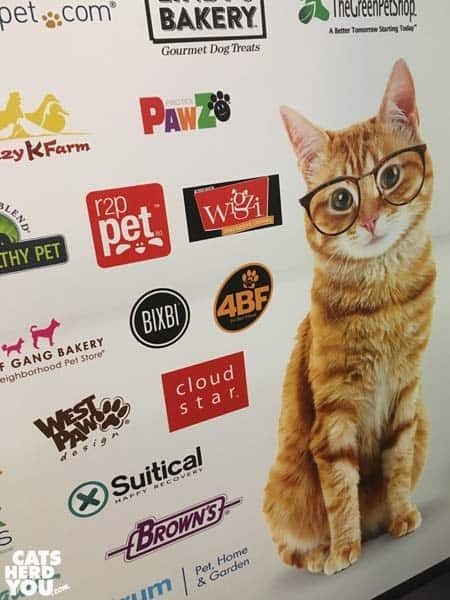 Most of the show signage and even attendee badges featured an image of a very smart-looking cat wearing glasses. 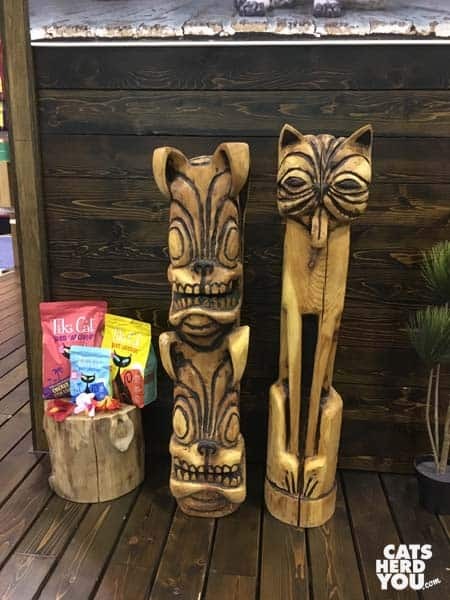 I often complain that cats are second-class citizens in the pet product world, so it was fun to see everywhere throughout the conference center. 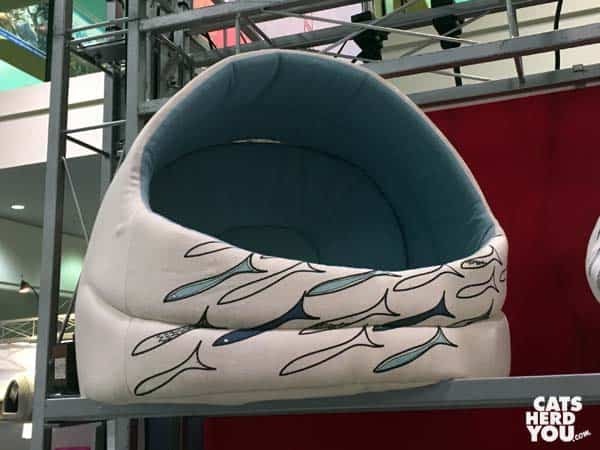 At least year’s expo, there were lots of companies making the egg-shaped felted wool cat beds. This year, companies were taking it to a whole new level with creative shapes. 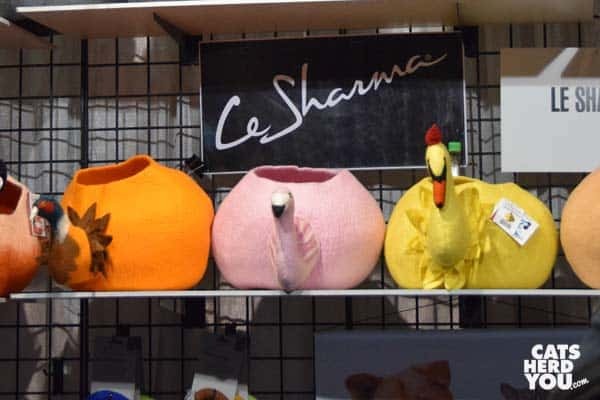 Not only are these cute, but many companies are sourcing them from interesting places, like Nepal, rather than making them in China. There seemed to be a lot more seasonal items for pets this year, especially beds. There are always Christmas items at the expo, but this year there were a lot more autumn and Halloween-themed products, too. When cat beds aren’t seasonally-themed, there is a lot more effort being made to make them into an attractive part of your household decor. Maybe the days of brown and beige beds are behind us at last! Attractive beds mean you won’t hide them away, so that’s a big win for your cat have a private space in any room of the house. Another big trend is cute stuff designed specifically to generate cute photos of your cat you can share on social media. Who wouldn’t want to tell all of Instagram that your cat lives in a pineapple under the sea? 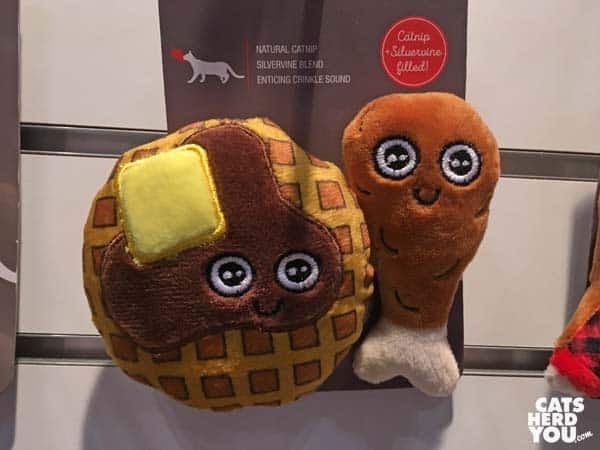 The category of items that people will buy because they will look cute on social media is especially strong in toys, with lots of novelty-shaped toys. Where you used to find toys sold individually, these cute, themed toys are very often packaged in thematic sets of two. Beds and toys weren’t the only things that seemed to be made for social sharing. 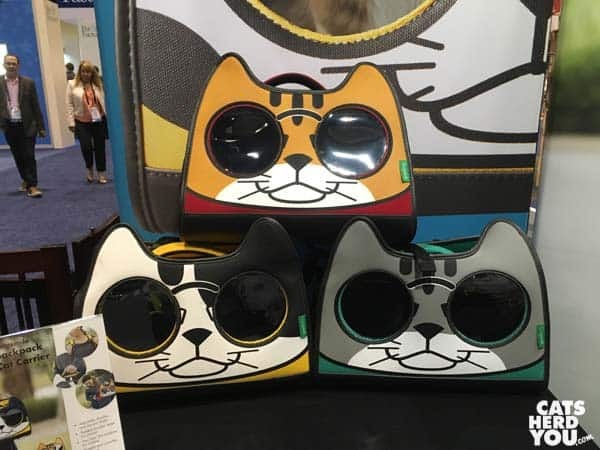 These cat carriers, intended to be worn as backpacks, seem to be designed to be viral sensations, too. Environmental consciousness continues to grow in the pet products industry. There has been a slow move for a while toward waste that recycles or breaks down in landfills. This year, several companies were being especially innovative about ways to approach environmental issues. 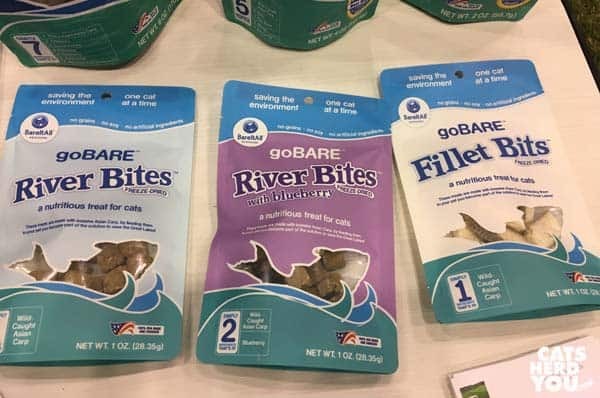 One especially clever one turns the Asian carp, an invasive species, into dog and cat treats. Another trend is luxury products. This seems to be a slowly growing market full of impressive bling, like this bed covered in sparkling crystals. 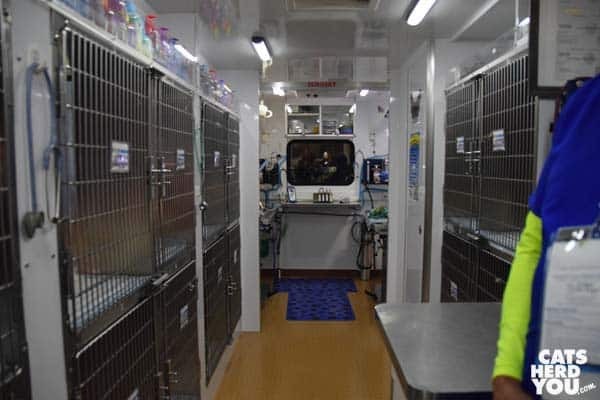 The Lucy Pet Foundation’s spay and neuter bus was on hand, and open for tours. This mobile clinic has performed over 16,000 spay and neuter surgeries for free for low income families and senior citizens. 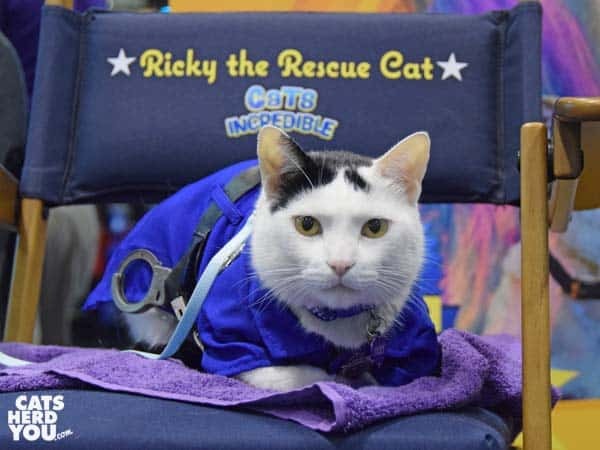 Their feline mascot, Ricky the Rescue was also on hand, looking remarkably calm in the busy convention hall. Tiki Pets had adorable tiki animal decorations. While I’m not excited about their new kibble, I will be looking into their newer non-fish offerings in cans. 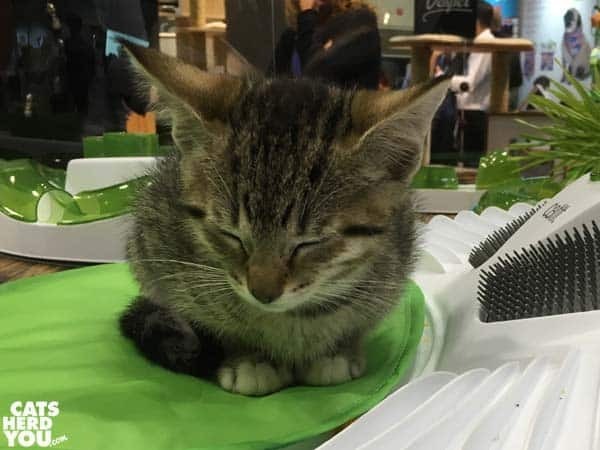 One way to make convention attendees stop at your booth is with kittens, and Precise Pet Products had kittens on hand from The Way Home, a local rescue organization. 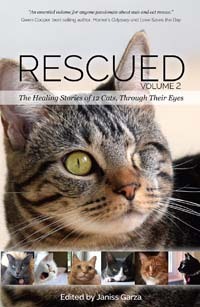 I liked hearing that not only was the rescue there with cats, the company was supporting them with a partnership to help feed their foster cats. Partnerships like that are so much harder for small rescues to get. 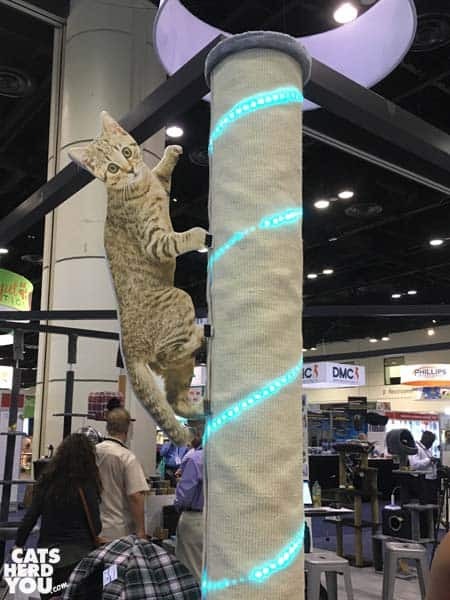 The Catit booth also featured kittens from the Pet Alliance of Greater Orlando, many of them playing hard with the large display of toys and food dispensers. This little one was all worn out after romping with the other tabbies. Some booths that didn’t have real cats on hand found creative ways to use cardboard cutouts for maximum eye-catching, too. We’ll be taking a closer look at more of the products we saw at the expo in the upcoming year, so stay tuned! Wow, how fun was that! 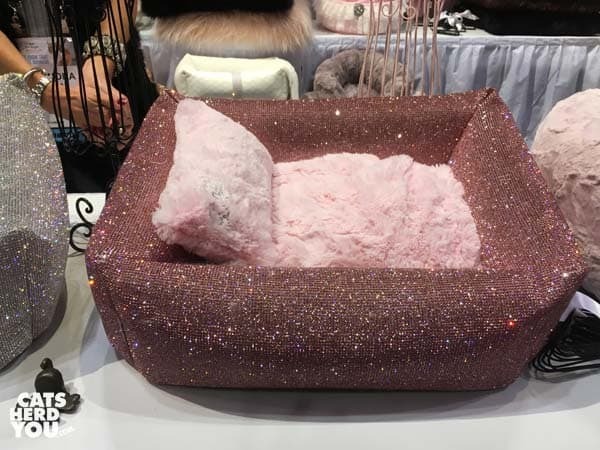 I want the bling-y bed! I think my human should have gone to this instead of staying home and being a publisher. 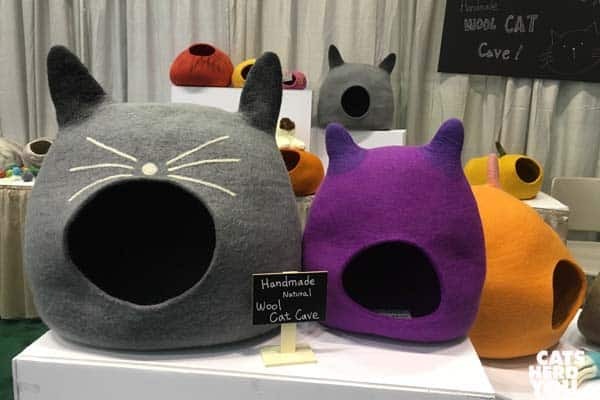 I LOVE those felt cat beds! You feature some lovely products! We love all the new products! We’ve seen the felt beds all over Pinterest and really really want one! Or two or three!! wow – that is pretty amazing. we love those treats using invasive species…. and some of those beds are totally adorable! As always, your recaps are superb! We have had a felt “cave” for a few years now….ours also came from another country (not China, I think maybe Sweden? We have had it for some time now and don’t remember). Love the ones with new shapes but I don’t think I would enjoy one with a Halloween theme because that is so temporary. I am strange and wouldn’t want to keep it out all year. Hoping another “trend” is that these marvelous brands realize they need to PAY bloggers to feature them (wink). Great recap! 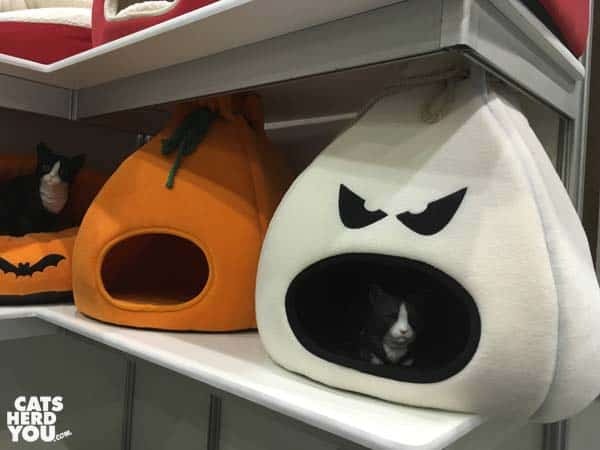 🙂 I totally want to steal that pumpkin bed.. Okay, I like the blink bed too, but there was lots of goodie to see! I wish Mom L had gone to the expo. My former shelter sure could use a deal with a cat food company to help with food cost for Kitty Corner. Miss Julie your recap was really thorough. Wow! You saw some things that I didn’t see! I love the sparkly bed. It was great to see you. Wish we could have spent more time together. Thanks for sharing about all the cool stuff you saw! 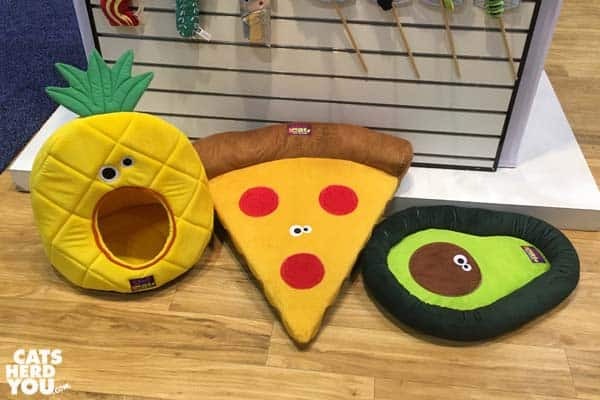 Love all the pet beds and cute toys! Looking forward to reading more about everything in future posts! 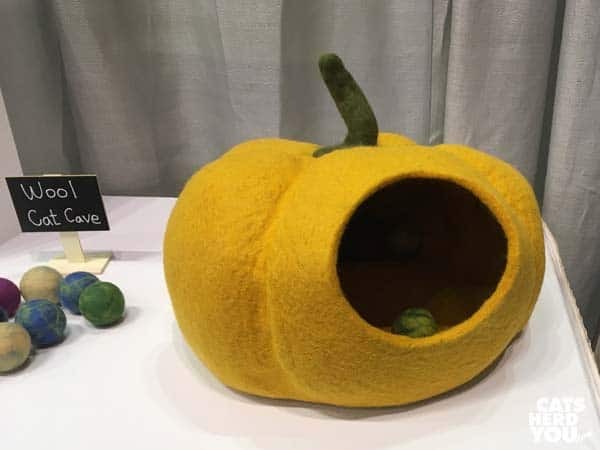 ohhhh I want a pumpkin bed. Those beds look fantabulous especially with the bling! Like the cat whiskers one too. Love those PTUs although I still wouldn’t go in it. I would pose next to it though. 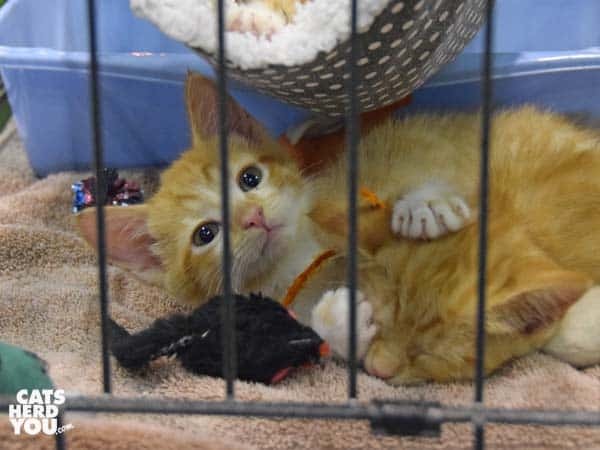 Hope some of the kitties got adopted. Look at all of that cool stuff!! Our mom really wanted to go. Maybe next year she can. That was a fun tour! We always like looking at new cat stuff and don’t have expos like that around here. Wow, this looks amazing! Thanks for the pictures and recap. I would love to attend one year. LOVE the fact they’re doing something positive with those awful carp. They’re really a problem around here, too.